How RevenueHits can help you turn your ad space into a veritable money tree. Publishers looking to generate more revenue are increasingly finding success with a self-serve platform with personal account managers for every need of the publishers. They had focused their efforts on optimizing the utilization of your ad space, while ensuring meaningful links between the ads it displays and the content you produce. 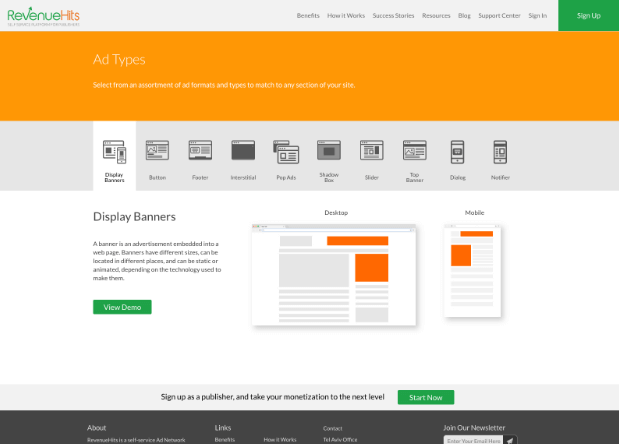 They have different monetization options such as Pop/ AdBlock Pop/ Direct Link/ Banner/ Shadowbox/ Desktop Interstitial etc. That means that your blog’s ad space will not show ads that do not perform well, as RevenueHits uses advanced algorithms to research and examine the ways to place the ads with the goal of continually improving their performance. RevenueHits is owned and operated by Intango, a global technology company established in 2008, operating in the digital media space. Intango designs and executes tailored marketing and monetization solutions, using our powerful, AI-driven proprietary technology and architecture. ad serving technology delivers more than two billion impressions daily. They’re able to scan millions of online ads and analyze publisher performance. Expert, accurate conclusions are then reached about how to best approach your marketing efforts. Their algorithm promises to optimize your earnings by finding the best performing offers for your site. What We Like: Efficient operation run by talented staff. Quick, powerful ability to integrate their ads into other formats on your site or as standalone ads. Highly responsive customer service via email. Strict and accurate payment policy so all payment arrives on time. Publisher Prohibited Content: Adult or mature content (content), hate speech, harassment, sales of illegal firearms and other content publishers would expect to see blocked on a mainstream ad network of this type. RevenueHits also prohibits a variety of navigation techniques such as redirection, unsolicited emails, forced clicks and other tactics as outlined in their terms of service. Verticals: Sport, Movies, Gaming, Music, Dating, Mobile, Shopping, Streaming, Blogging, Coupons, Travel, Entertainment, Insurance, Software, and more. Creating an Ad Unit: After website is accepted, open Publisher dashboard. Select style and type of ad. You’ll then receive a code snippet to place on your page. Support is available via website and email. Display Ad Unit Sizes Available: RevenueHits supports all common banner dimensions, as well as Pops & Interstitial formats. Control Panel: The dashboard is intuitive with a clean design. You can manage your account, ads and transfer finances easily. AdSense has its place, but many publishers prefer an alternative. Founded in 2008, has grown steadily and strongly. Today, many publishers consider RevenueHits the most legitimate rival to Google AdSense, and the best way to increase their overall monthly earnings. In order to understand what we like about RevenueHits, let’s first take a look at what we dislike about Google AdSense. First, publishers can be banned from AdSense. Even reputable publishers can find their accounts incorrectly banned by Google. This can be a time-consuming hassle to undo. An account on RevenueHits is approved immediately. Their terms of service are very clear, too, which means you should never be banned out-of-the-blue. As stated on their site, RevenueHits wants to run a “decent, respectable business.” They don’t want you to place any unapproved Network Tags. They also prohibit a variety of underhanded tactics such as misleading links, automatic redirection, unsolicited emails, forced clicks and the like. These are tactics you’re likely avoiding on purpose already. So, these restrictions in both content and SEO techniques shouldn’t be an issue for the vast majority of publishers who want to use RevenueHits. There are other issues with AdSense, however. Publishers make good money from AdSense, however… Once you do earn money, transferring it into your account is often a hassle. RevenueHits gives you a greater percentage of the profits. Plus, transferring money is much easier. You can withdraw once your account has a balance of $20. This is compared to the $100 limit for an AdSense account. Also, RevenueHits supports PayPal while AdSense does not. Plus, let’s face it: AdSense is getting old. People recognize AdSense ads and banners. People avoid ads almost unconsciously these days. In order to reach your audience, your ads are going to have to appear exciting, interesting and new. This is where excels. There are more ad options available including pop ups, pop unders, ad block pop under, banners, sliders, footers, site-under ads, desktop interstitial and more. 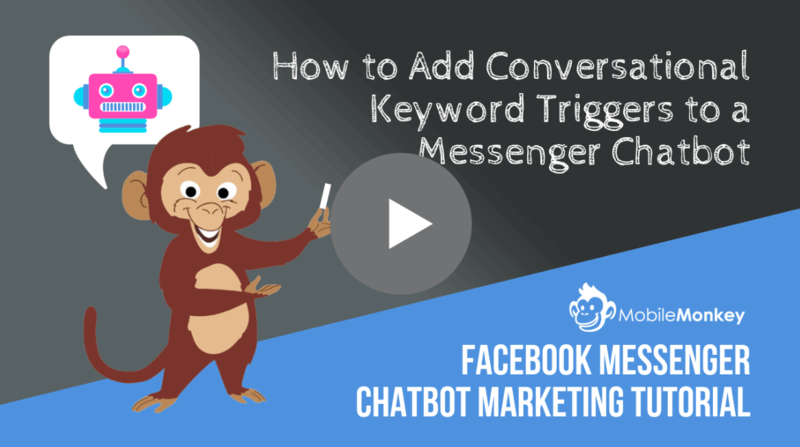 The more ad options which are available, the better the target audience can be reached and engaged with. Even better, the ads are designed to engage with your audience specifically and can be customized for you. AdSense doesn’t always show ads which are interesting to your website visitors. RevenueHits attempts to improve upon this with their Geo Targeted ad network. The ads will display according to culture, geography, interest and other key factors. No more banner ads for products from a different country which has no connection to your visitors! Moreover, RevenueHits has come with one of the latest and revolutionary monetization option, and that is Desktop Interstitial. It is a great replacement for pop, Google safe, and it has high payouts due to the fact that is used by premium advertisers. The Cost Per Acquisition-based advertising network displays ads based on your website traffic. This is better than basing them on the needs of the advertisers. The goal of RevenueHits isn’t always to generate the most traffic, it’s to maximize the income you receive from the traffic you already generate. Opening a RevenueHits account is easy. Signing up as a publisher is free. After clicking on the “” button, you’ll be asked to input some information. You’ll need to enter your site name. This includes the URL and a description. They give you a fair amount of room, so don’t be afraid to go into detail about your site. 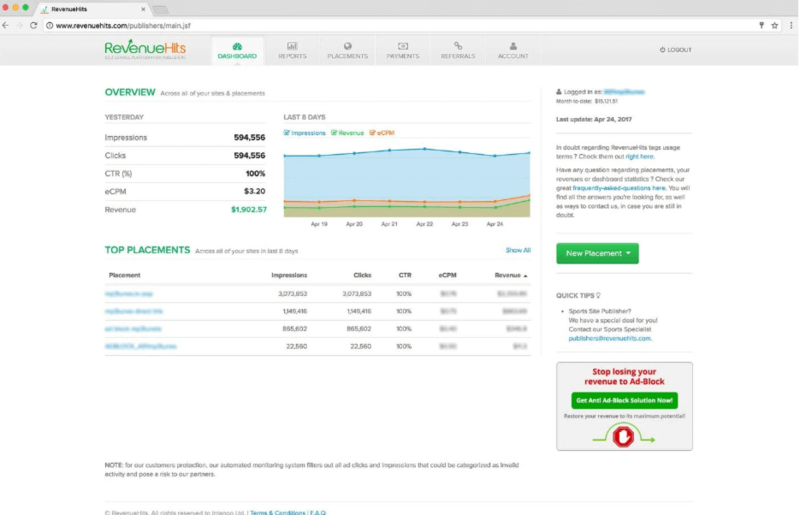 This will help RevenueHits find the most relevant ads possible. You’ll then enter Partner information. You’ll need to know the username, password and some other details. Finally, you’ll set your billing preferences. Your options for RevenueHits are PayPal, wire transfer, Payoneer and Bitcoin. Then you’ll accept some terms and conditions. That’s it – you’ve created a RevenueHits account. You can get started right away. Creating ads is intuitive. While we won’t guide you through every step here, rest assured if you can publish a blog you can probably handling navigating the RevenueHits menus. Of course, that’s not to dismiss the skills behind selecting and placing ads on your ads. The more you’re able to maximize your best performing banner ads, the more you can increase your revenue. Money issues in general were handled very well by RevenueHits, including both revenues earned and the overall transfer of payments. Publisher earnings vary from a few cents up to $60 eCPM. This is effective Cost per Thousand Impressions. This is the total earnings divided by the total number of impressions, in thousands. eCPM is one of the best performance metrics available. 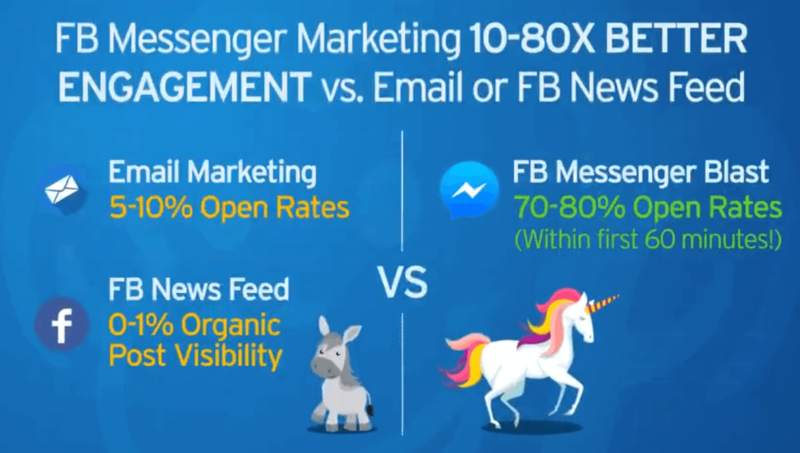 That’s why it’s the most common metric measured when comparing results across different advertising formats and types. As with any performance ad network, the exact earnings are based on many factors, some of which are entirely publisher dependent. Examples of such factors include site content, user behaviour, ad positioning and traffic geo. But this should hardly be new news for publishers. If nobody wants to visit your site, you’re not going to bring in a lot of advertising revenue. This is a performance-based network. Revenue shares are paid out of publisher’s traffic sales. For publishers who are already able to bring in a decent amount of traffic, however, RevenueHits will be able to provide maximum efficiency. Even better, your advertising revenue will grow along with your audience. Payment can sometimes be an issue with performance ad networks, especially if country lines are being crossed. Fortunately, we’re happy to report that RevenueHits had no issues with payment during our repeated tests. RevenueHits pays in net 30 terms and on net 15/0 or weekly payments. This means you’ll have your money by the end of the next month at the latest. They categorize the finances this way: “Earnings” are your revenues for the current monthly period. “Balance” is the accumulated money which will be paid in net 30 terms. RevenueHits absorbs bank fees on their end. Publishers are responsible for any bank or processing fees on their end. 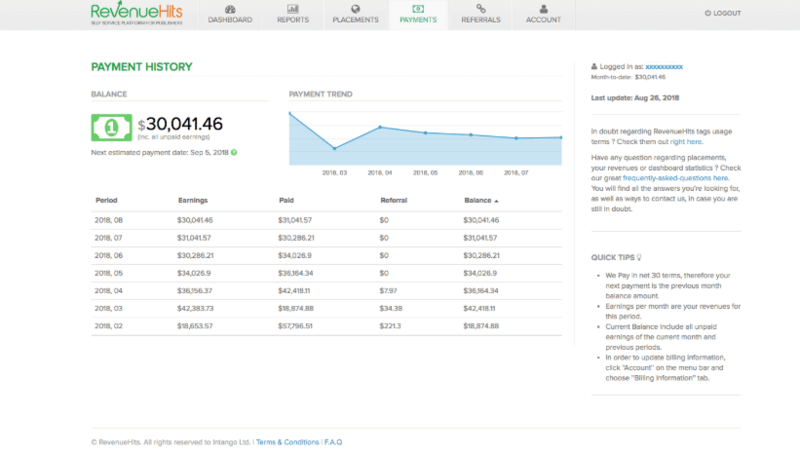 Transferring and tracking earnings is easily done through the RevenueHits dashboard. The simplicity and clear design of the dashboard is both a plus and a bit of a minus. The positive is the system is easy to use for publishers. Once you’ve created an account, you should have no problem managing your account, setting up your ads and handling your revenue. While most publishers will find navigating RevenueHits to be fairly intuitive, the best way to solve problem is probably going to be contacting customer support. Their support staff is friendly and attentive, plus you will have your personal account manager, but some people would rather search a large database and find the answer themselves. Once you are familiar with how RevenueHits works, there’s a lot of flexibility. One positive we really liked were the large number of vertical available. Other networks limit themselves to a few verticals such as entertainment or gambling. RevenueHits provides enough verticals so that publishers can find their niche, instead of trying to compete in an overcrowded area. RevenueHits offers verticals in Movies, Music, Gaming, Sport, Dating, Mobile, Shopping, Blogging, Streaming, Coupons, Travel, Entertainment, Insurance, Software, and more. This ends up working well for both large and small publishers. 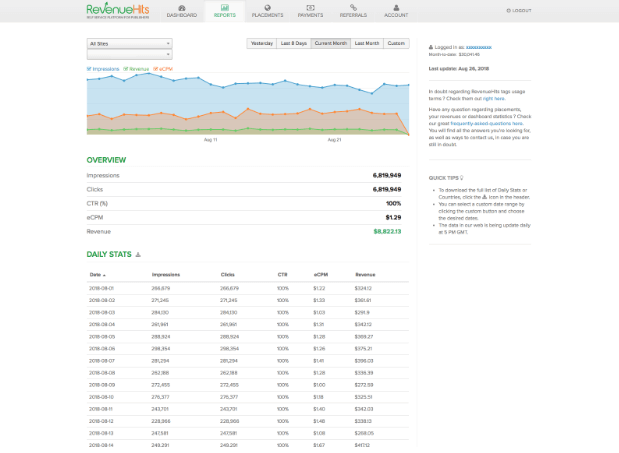 RevenueHits has the capability to identify small markets and advertise to them effectively. In the end, you do have to make a choice. The Terms and Conditions of AdSense won’t let you use RevenueHits at the same time. But AdSense can be disabled with one click. And RevenueHits is free to install. If you’re not happy with AdSense, we do recommend you try out RevenueHits. You’ll quickly be able to determine if you like what RevenueHits has to offer. They do have quite a bit to offer. They’re an effective Performance Ad Network. Using contextual and geo-targeted Ad-serving technology, they can help publisher generate more revenue. Online assets can be monetized more effectively. This includes not only websites but add-ons, widgets, toolbars and, of course, mobile. Founded by publishers, for publishers, RevenueHits understands your needs. 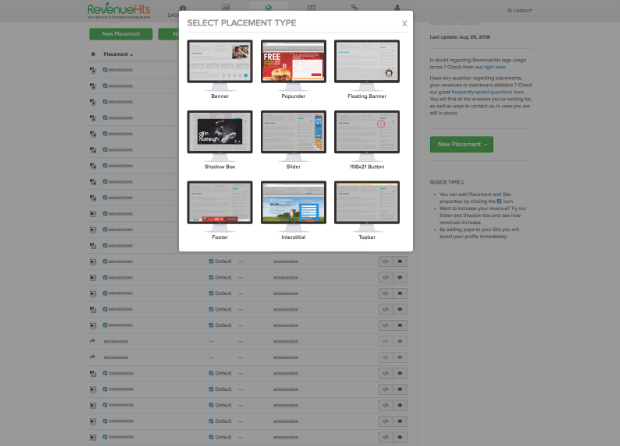 Overall, RevenueHits is one of the few serious competitors to AdSense. If you’re a publisher looking for a new way to increase your revenue, maybe it’s time to put AdSense behind and give “the other” ad network a try. There’s a lot to recommend about RevenueHits.